Our friends, Scot and Maurine Proctor, who run Meridian Magazine, are teaming up with Steve Studdert to enlist volunteers willing to go to Haiti. Studdert is chartering a plane that will take 150 volunteers to Haiti. Men and women with construction and medical skills are needed. Individuals with French/Creole language skills extremely desired. 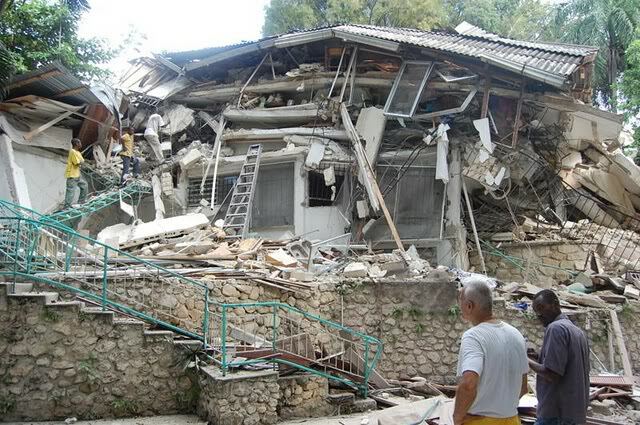 The plan is to “report for duty” at the Healing Hands facility (now destroyed – photo below) started by physician Jeff Randle, who served an LDS mission to Haiti. Volunteer link at bottom of post. To read entire article by Studdert click here. Studdert served as White House advisor to three US Presidents and has had extensive global disaster experience. He is the author of America in Danger (fascinating read). The plane will leave from Salt Lake City next Wednesday or Thursday. Volunteers will be gone for 21 days. Meals/T-shirts/Tents will be provided. All costs from Salt Lake to Haiti and back will paid for by donations. Scot and Maurine will document the relief efforts first hand. You can watch for their articles on Meridian during the coming weeks. Like most of you, having watched all of this from afar, I’ve been wanting to do more. Faces like these make me want to find babysitters for my healthy, safe, well-fed children and board that plane today. But I found solace in Maurine’s words to me, “Another season – another disaster. You’ll be there.” For now, this is my small way to help. Link Meridian’s article into an email and pass the word. To sign up for Steve’s mission, go to Utah Hospital Task Force. And here is more info about Healing Hands. Years ago Doug memorized Donne’s poem. We find it so poignant right now.